Well, I’ve been with the ghost of Thanksgiving’s past today. 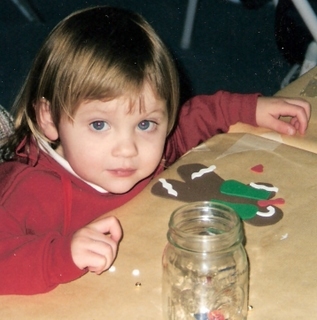 I wanted to talk a bit about our family Thanksgiving traditions as I planned this years holiday, so I went back through my memories and my pictures. I laughed some, and I cried some. But I’m thinking it’s not a bad thing. The crying, I mean. I wonder if it might actually be good to stroll down memory lane before embarking on this years celebrations? I’m feeling overwhelmingly thankful for family and friends right now. I’m also determined to make the absolute most out of the holiday season. 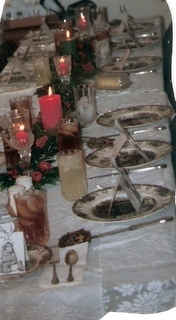 Today I’m gonna show a few pictures of Thanksgivings past. Maybe you can get an idea or better yet, give me one! I don’t remember how Thanksgiving Day became so huge in our family, but I’m pretty sure it was Mom’s doing. 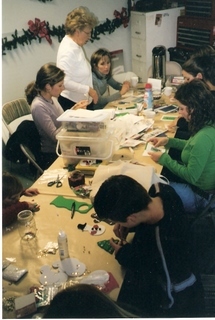 4:00-5:30~Adult craft! Less crafty men must babysit! 7:00~Turkey Sandwiches and watch the lighting of the Great Tree! Bethany & Stephanie were home-schooled and every Thanksgiving we spent weeks getting together a presentation for the family. They did it on everything from the obvious, (the Pilgrims) to the fun (The History of the Macy’s Thanksgiving Day Parade). Here is one of the early presentations my little Pilgrims did…I’m pretty sure this is why they both love to speak in public! 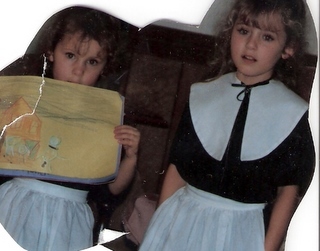 Okay, before I go on, I want to say that the year after we ditched the Pilgrim outfits, we still had to dress alike. But at least it was just sweat shirts! One of the “early craft times”! I have no idea what we were making! Later, mom converted her entire garage into craft central! What pray tell do you suppose she was thinking? 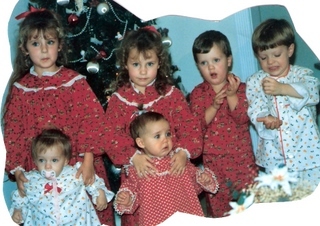 Now, the Jammies…My sis and I always made the kids Christmas jammies…and once again, I am my mother, they had to match! My kids are in the red ones and Deb’s kids are in the lighter ones. Note my baby, Emma…she’s about to loose it and poor Stephie has the task of keeping control! 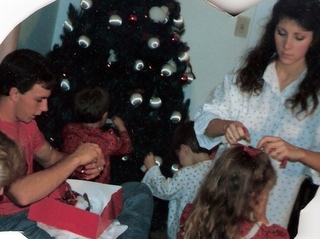 I had to put this in here…this is us a long time ago, decorating Mom & Dad’s tree. That’s my handsome brother, David, right before he was diagnosed with cancer. So that’s how we thought we’d celebrate Thanksgiving Day forever. But nothing stays the same. God sometimes calls people home before we’re ready to see them go. Chubby children have the nerve to grow up and have lives of their own.Life changes and we have to change with it. Now, I don’t want to get too heavy…but as we’re getting into the Holiday season, remember to do what my bud, Gitz reminded me yesterday, (http://gitzengirl.blogspot.com/2008/11/be-intentional.html): Be Intentional! « The girls in my family hate the Pilgrims, I blame the outfits! We have starting watercolor painting at our house. We will sit for hours together and doodle. It has brought us closer, away from the tv and give us a since of togetherness. Your memories are a special gift. I am so glad you have them of your mom. She was so special and she lived with intention. You are both a great example to me. I learn a little each time I read your blog. It is helping me love my children in a way I was not brought up. I woke up with an odd sensation. I was seeing your children in those Thanksgiving outfits. I remember the sweetness one Thanksgiving way back when. I stopped by to visit the “real Pilgrams” at your mom’s house. It felt as though I visited a movie set but the people weren’t actors. They were really worshipping and being thankful. And even doing it creatively. This morning I thought how could they (our children) have grown up so fast. Where’d it go? So fast! What a gift of love for you to create this blog. We can’t go back but we can make the most of each day to come. Heck, maybe I”ll even learn to sew. Just kidding. It’s more about the love and thought. I absolutely love this! Maybe you would be so kind as to share some of your craft ideas with us and we could be inspired to create a little “tradition” in our families too. I too think intention and memory making/tradition go hand in hand, thank you for the additional reminder! And oh my, but that schedule is something to behold! The weirdest things make me cry. Like the thought of the children putting on Christmas jammies and decorating the tree on Thanksgiving night. I promise it wasn’t the men’s babysitting part right before that. It might have had something to do with that thought being nestled in the middle of such a detailed schedule. I love a pretty schedule. I wish you had pictures, too! Maybe somebody can let you copy theirs. This was great. Your family does the holidays with excellence! I will be revisiting this post a few times as I get ready for Thanksgiving. Something about it is helpful as I face my first Thanksgiving without my big brother. I love getting to slip into your memories like this… (we often had matching pjs too!). It seems to me, from all your stories, that your mom showed you how to live with intention so beautifully… and you are carrying on her legacy and making it your own. I can’t be with my family any more on the holidays since I can’t travel, but it’s made me realize how much I love the traditions… but also that it’s the moments we make that count. Now my moments are me on Skype talking to my nieces and nephews as they show me their Christmas gifts… not a typical tradition but one I cherish anyway. I’m sure it feels so different to you without your mom and your brother, but you’ll make it something to cherish, too. I love you Mom! What fun memories!! I can’t wait for Thanksgiving this year! !